ELISE Nazzari is no fan of heights put she put her fears to one side to raise money for Youth Focus. The Burswood resident and Miss Galaxy Australia national finalist skydived in Rockingham on Sunday. Ms Nazzari, who dealt with anxiety and depression as a teenager, has raised more than $860 so far in her quest to raise $1500 for the mental health organisation. “I was very scared to be doing it and the fact it was meant to be on Saturday and postponed because of the bad weather added to that,” she said. “When I was sitting on the edge of the plane it felt like quite a while but it was only about one minute. “I was just thinking to myself that I needed to be brave and not to cry. Ms Nazzari said she was scared of heights, which included roller coasters. “I was able to tackle something that I never wanted to do,” she said. 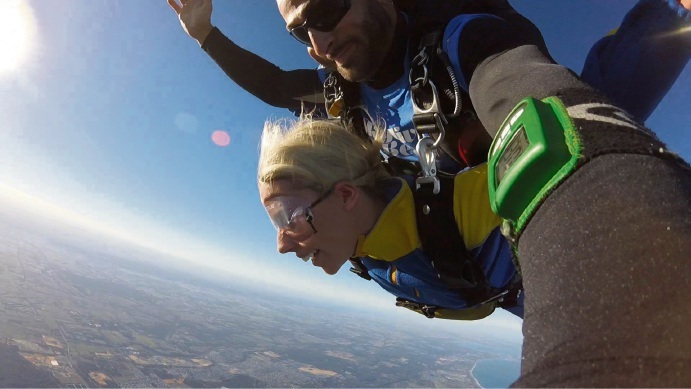 “The idea came after I attended the opening (indoor skydiving business) iFLY in Belmont as part of Miss Galaxy Australia and it was suggested to me as a way of raising money. Ms Nazzari will compete in Miss Galaxy Australia finals on the Gold Coast on April 1.